Many Freemasons are curious as to what is the oldest Masonic Lodge in the world. Lodge of Research, publisher, 1964. Brother Denslow also founded the Royal Arch Mason magazine in 1942 and was instrumental in founding the Missouri Lodge of Research. 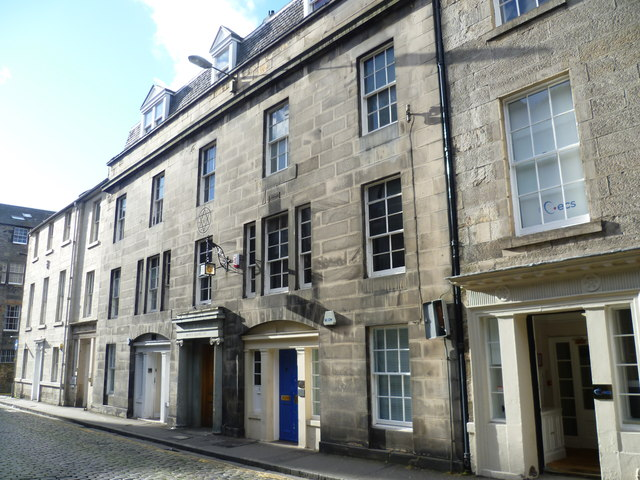 The oldest Masonic Lodge in the world (with verifiable lodge minutes) is the Lodge of Edinburgh No. 1, Edinburgh, Scotland...sometimes known as Mary's Chapel. In July, 1949, it observed its 350th anniversary of its establishment. In 2008, (at the time of this writing), Lodge of Edinburgh No. 1 is 409 years old. Oldest Masonic Lodge Minutes - July 31, 1599: Lodge of Edinburgh No. 1 has records to prove its long time existence as the Oldest Masonic Lodge. Most impressively, its first 5 pages of minutes incorporate the Schaw Statutes which are dated December 28, 1598. Six months later, on July 31, 1599, are to be found the minutes which confirm the lodge's claim as having the oldest existing Masonic minutes. It must be noted, however, that from these minutes there exists no conclusive evidence that the lodge was actually constituted on this date nor that it is, in actuality, the oldest lodge. Schaw Statutes: The Schaw Statutes (part of the Old Charges) are named for William Schaw, who was Master of Work to His Majesty and General Warden of the Masonic craft. In these Statutes, he declared that theses ordinances issued by him for the regulation of lodges considered the lodge at Edinburgh to be for all time, the first and principal lodge in Scotland. Lodge of Edinburgh No. 1 was first called "The Lodge of Edinburgh" and retained this name until 1688, when the Grand Lodge of Scotland confirmed its charter, designating it as "The Lodge of Edinburgh (Mary's Chapel) No. 1"
Both were affiliated with the lodge, taking the obligation on the "Breeches Bible", which was printed in 1587. The pen with which these 2 brothers signed the roll is still preserved in the Edinburgh Lodge No. 1 museum. First Operative to Speculative in Scotland - 1600: As early as 1600, The Lodge of Edinburgh began to admit non-operative Freemasons. In June, 1600, the Laird of Auchinleck was made a speculative member, the first authentic record of the making of such a member. The famous Dr. Desaguliers visited the The Lodge of Edinburgh on August 24, 1721. He had served as Grand Master of England and was referred to as "General Master Desaguliers". On the next day, while he was present, the Lord Provost of Edinburgh, the Treasurer, the Deacon Convener of the Trades and the Clerk to the Dean of the Guild Court were admitted as members. This date is thought to mark the change over from operative to speculative Freemasonry in Scotland. Inception of Grand Lodge of Scotland - 1736: When the Grand Lodge of Scotland was established on November 30, 1736, Lodge of Edinburgh took an active part. Thirty-three lodges were represented at the meeting which was held in the lodge room of Edinburgh Lodge. Because the oldest minute of a lodge was that of Edinburgh Lodge, it was placed first on the roll of the Grand Lodge. Lodge Kilwinning - 1642: Lodge Kilwinning was the second oldest Masonic lodge because of its records dating to December 20, 1642. (It is believed there may be older lodges, but empirical proof has not been found.) Considerable friction developed in 1807 when the Grand Lodge of Scotland permitted Kilwinning to prefix the word "Mother" to its name.